Anyway, I wanted to share an update on our family room renovation - yes, the one that started way back in January! There is a reason I have been silent about the reno. Honestly, I'd rather just show you a bunch of pretty "after" pictures at this point. But unfortunately, we are still far from the finish line. We hit a stumbling block in the renovation, and it had to do with the new walls. 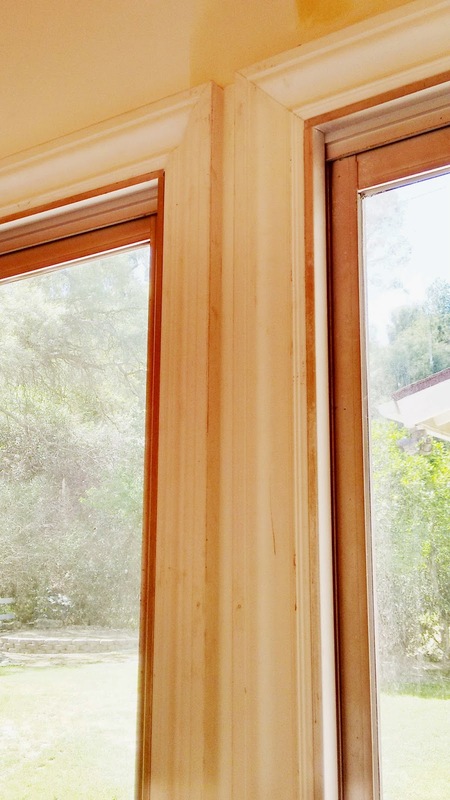 As expected with all renovations, there may be issues that arise that kinda stump you. In this case, the new drywall took some figuring out... and it put us in a holding pattern as a result. Sigh. After we primed and painted, we noticed "seams" where some of the sheetrock pieces were joined. Our contractor has had to come back on a few occasions to redo those particular areas. The third (and hopefully last) attempt required him to cut open the seams, re-tape, re-mud, re-sand, etc. Yesterday, he also took down the tarp barrier that was in place during demo and construction. He believed that the heat retained in the room may have contributed to the seam issue (since air wasn't properly circulating while the tarp was up). It's been so long since we've had a continuous sight line into our family room! He comes back on Wednesday to check on the walls. 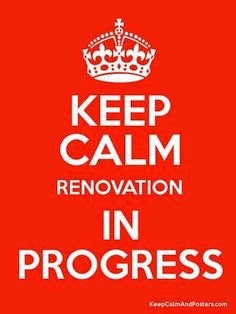 We are crossing our fingers that the issue is finally resolved, so we can forge ahead and put this room back together. On a positive note, my handy hubby did tackle a few things in the room that wouldn't be compromised by the messy drywall work. My hubby also built and installed the foundation for the new built-in cabinetry. I'll share about the built-ins once they are done. The white electrical cord is long gone - well, camouflaged! 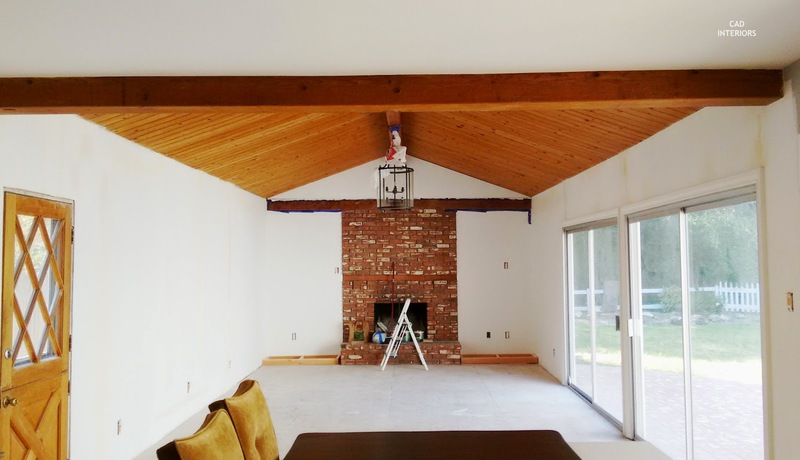 The electrical conduit was painted to blend in with the wood ceiling beams. 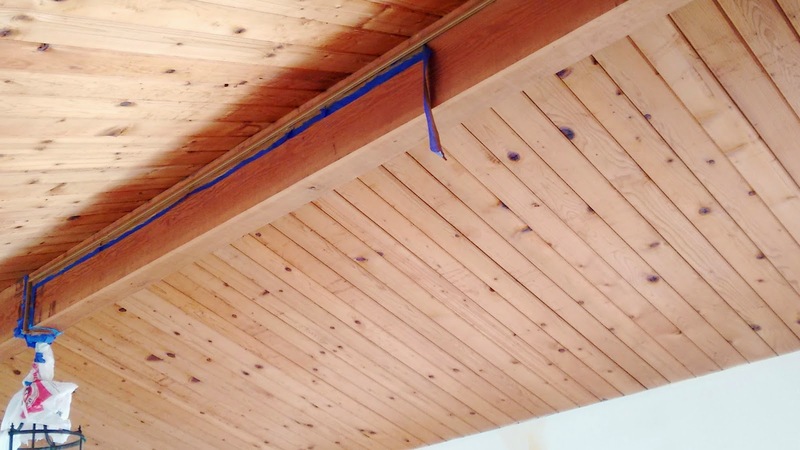 We "color matched" the beams with paint called "natural cork". I think it covered up the conduit just fine; and, for roughly $2 (in sample size paint), it was an economical and effective solution. There is still plenty to do, including fixing up the fireplace, re-doing the dutch door & door jamb, finishing up the built-ins, installing all the trim, and putting in new flooring and baseboards. 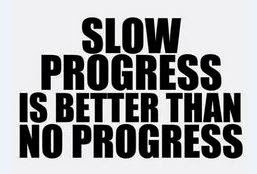 But slow progress is better than no progress! At this rate, I'm just hoping to have the room back by the holidays. I'm kidding...I hope? !